The Chinese Mountain Cat (Felis bieti), also known as the Chinese Desert Cat, is a small wild cat of western China. It is the least known member of the genus Felis, the common cats. A 2007 study found that it is more likely a subspecies of Felis silvestris; if so, it would be named Felis silvestris bieti. Except for the colour of its fur, this cat resembles a European Wildcat in its physical appearance. It is 27–33 in (68.6–83.8 cm) long, plus a 11.5–16 in (29.2–40.6 cm) tail. The adult weight can range from 4.5 to 9 kg (10 to 20 lbs). The fur is sand-coloured; the underside is whitish, legs and tail bear black rings. In addition there are pallid vertical bars, which may be hardly visible. 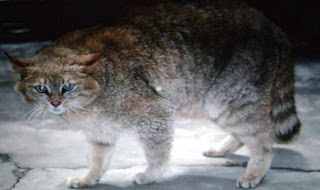 The Chinese Mountain Cat is endemic to China and has a limited distribution over the northeastern parts of the Tibetan Plateau in Quinghai and northern Sichuan. It inhabits sparsely-wooded forests and shrublands, and is occasionally found in true deserts. It can live in environments as much as 3,000 meters (10,000 feet) in elevation. The species was first described in 1892 and is known only from six animals, which lived in Chinese Zoos in 2007 and a few skins in museums. 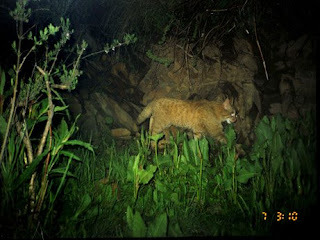 In summer 2007 some photos of this elusive cat were caught by camera traps in Sichuan. The Chinese Mountain Cat is active at night; it hunts for rodents, pikas and birds. 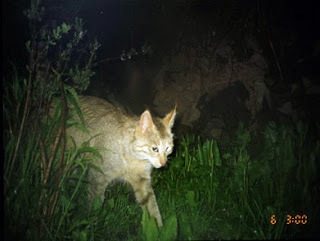 This cat is protected in China, but it is still endangered due to the organised poisoning of pikas, its main prey; these poisonings either kill the cats unintentionally, or withdraw their food basis.